Since New Again has been offering Smart Repair as a service, we have discovered that your garage, far from being a safe place to put your car, is actually one of the places where damage occurs. And so for a number of years we have been looking at what exactly it is that causes the damage and trying to offer solutions to help you avoid dents and dings, chips and scuffs. The first thing we always suggest is that you put your lawnmower and kids bikes in the shed or make other provisions. Hanging stuff up is sometimes a good idea, or generally making sure the garage is tidy and that anything that you store there is secure, i.e. ladders are not going to fall onto your bonnet! But even if you reserve your garage only for your car, we find that garages are built too small in this day and age -- getting the car in can be a bit of a squeeze. Knowing just how far to pull your car forward can be tricky, it's not a problem when you are paying attention, but after a while, when you get complacent, and one day when you are in a hurry - Bump! The bumpers on modern cars aren't really made for bumping, they tend to be designed to crumple and they are usually painted, meaning that even a slight bump can lead to hundreds of pounds worth of damage. If you have ever been to New Again you may have noticed that we use a little yellow mat when reversing into certain parking spaces. 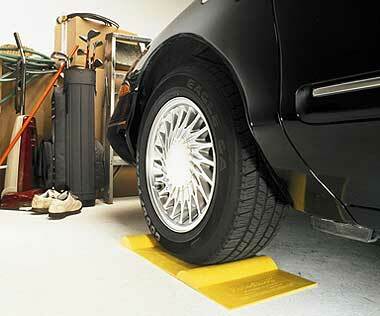 We think that the Parking mat is a wonderfully simple idea to help prevent damage which is all too common. As you pull forward onto the mat, there is a tongue which your car's wheel easily rolls onto to stop the mat slipping, then you just slowly pull forward until you feel the wheel pass over the bump. And that's it! It's not high-tech or complicated, so there is nothing to go wrong, which is why Parksmart can offer a lifetime guarantee. Another problem is that garages are too narrow, hardly leaving enough room for you to open the doors enough to get in and out. This leads many people to chip the edges of the door. It's never enough just to be careful, if the danger is there, then sooner or later the door edges will get chipped or even dented. This kind of damage isn't just unsightly, it actually devalues your car, especially if the chips go through to the metal and rust sets in, which is often the case. 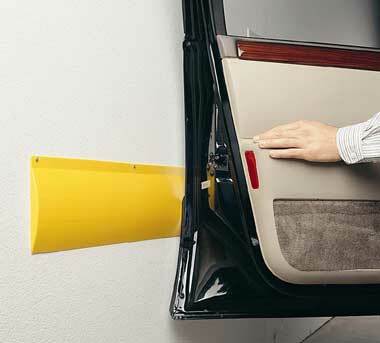 The Wall Guard is simply fixed to the wall, it is made of a synthetic rubber which can flex and so absorb impacts and therefore protects both your car door and the wall. 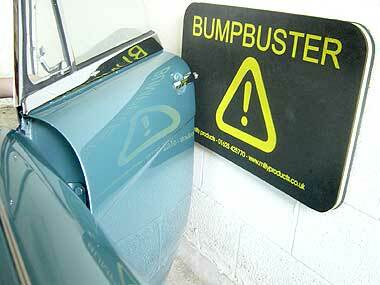 As an alternative to the Wall Guard, you could try the Bump Buster! These thick cushioned pads are larger (710mm x 455mm x 30mm) and offer extra protection, not only can they be used to protect doors, they can be placed at the end of the garage to protect bumpers, you can even place them on low ceilings to protect your tailgate... at £19.50, this is an excellent investment when you consider the cost of repairing a tailgate would be £80 or more. The bump buster only takes a few seconds to fit by means of a self adhesive backing - it doesn't require screws or brackets. Thedos and don'ts of personal car leasing, business car leasing and contract hire.